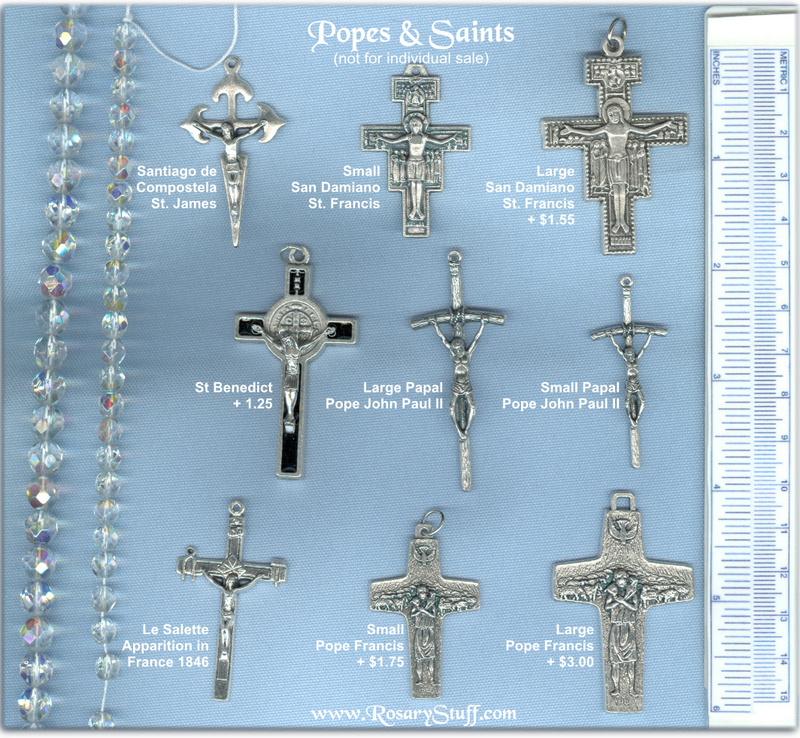 Silver Plate Crucifix Choices: Popes & Saints (NOT for individual sale). See the description below for additional details and pictures. 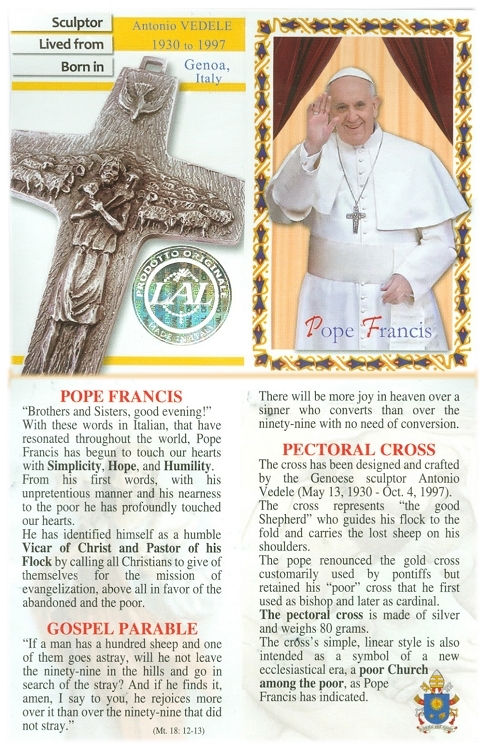 The "Popes & Saints" group contains a variety of crucifixes linked to several popes and saints throughout history including Pope John Paul II, Pope Benedict, Pope Francis, St. James, St. Francis, and the visitation at Le Salette! 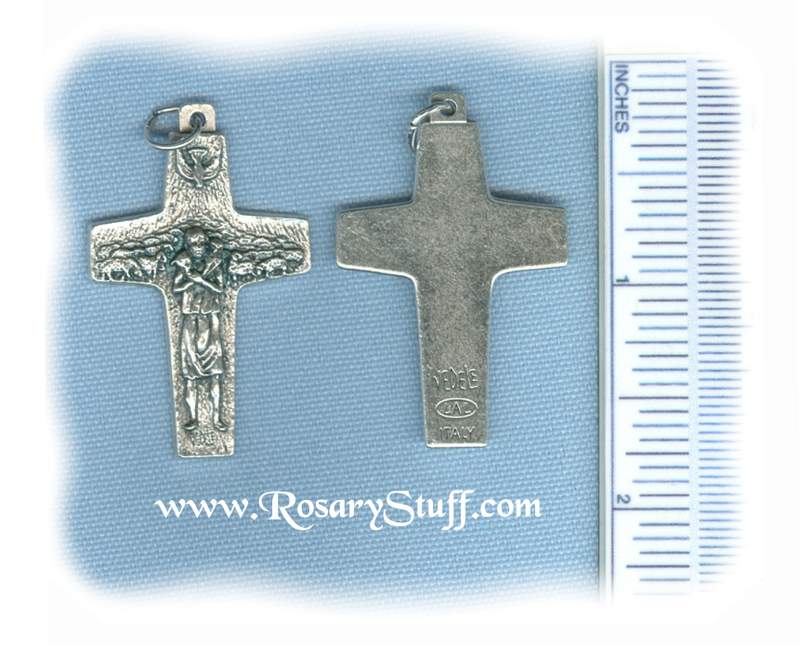 The larger picture above includes both 6mm and 8mm beads to help show how different crucifix sizes look with the different bead sizes. 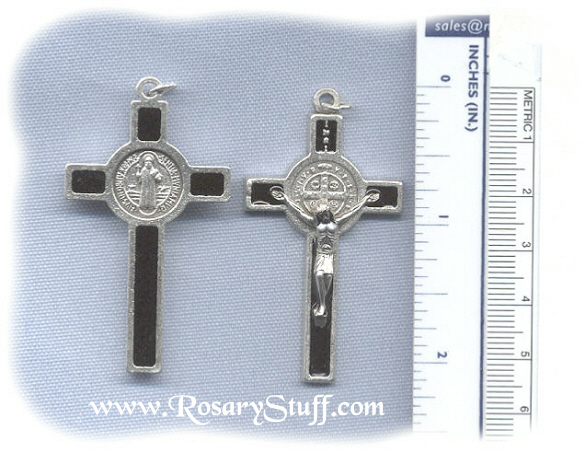 You can also click on the item name below to see a larger picture of the front and back of that particular crucifix. 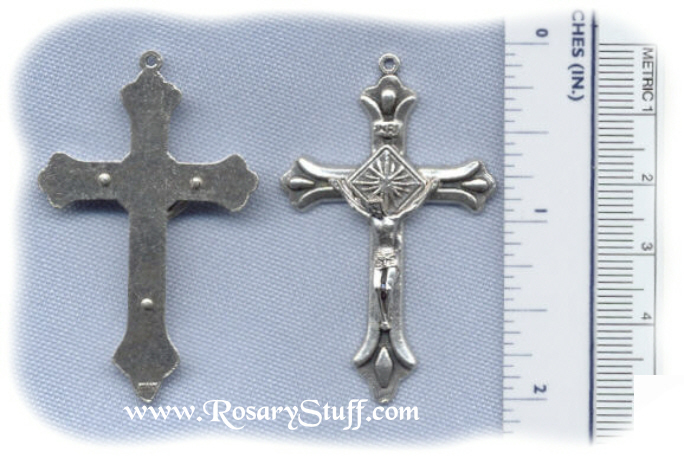 If you would like to see a picture of your favorite rosary center and crucifix together before making your final decision, please don't hesitate to CONTACT ME. 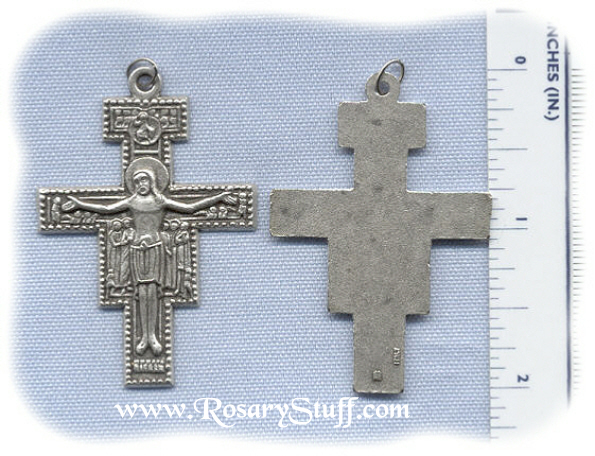 Santiago de Compostela: This Italian oxidized silver plate crucifix is tied to St. James the Greater and is 1 3/4 in tall (including ring) by 1 in. wide. For more information about St. James the Greater click here. No additional cost. 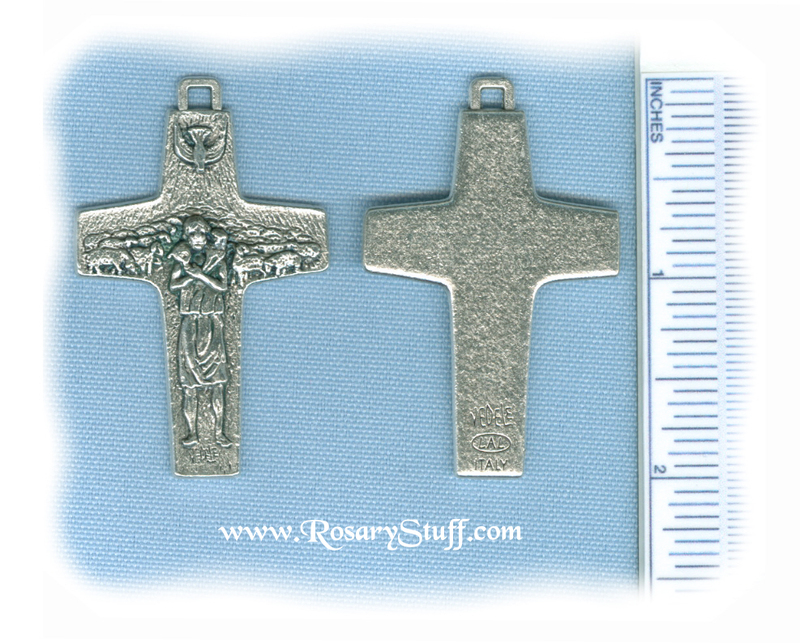 Small San Damiano Crucifix: This Italian silver plate crucifix is tied to St. Francis of Assisi and is covered with various scenes from Christ's life. On the back are the latin words “Benedicat tibi Dominus et custodiat te ostendat faciem suam tibi et misereatur tui. Convertat vultum suum ad te et det tibi pacem Dominus benedicat te”, which translated means “The Lord bless you and keep you. May He show His face to you and have mercy. May He turn His countenance to you and give you peace. The Lord bless you”. For more information about the story of St. Francis, click here. 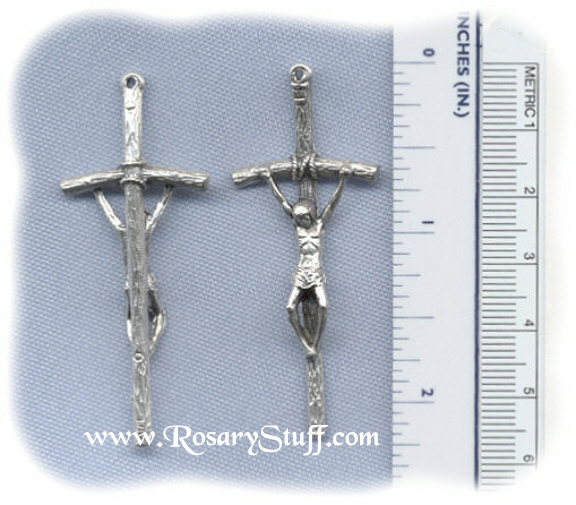 The crucifix is 1 5/8 inches tall (including ring) by 1 inch wide. No additional cost. 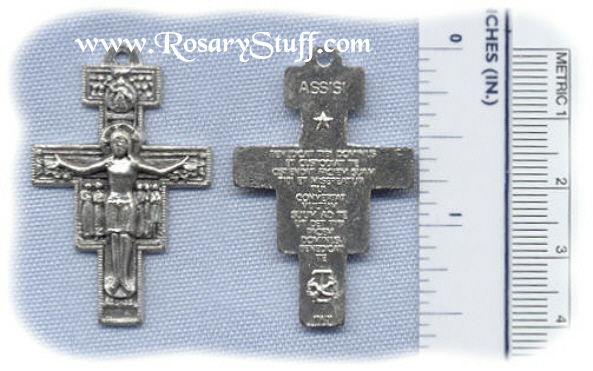 Large Papal Crucifix: This simple Italian silver plate crucifix is the same design carried by Pope John Paul II. It is approximately 2 1/4 inches tall (including ring) and 1 inch wide. Click here for more information about Pope John Paul II. No additional Cost. 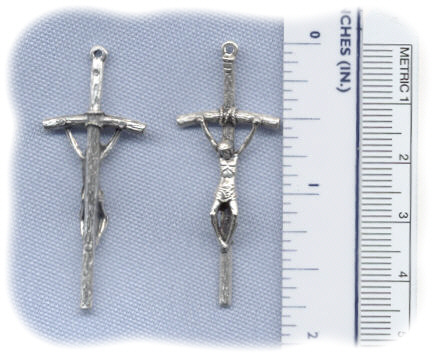 Small Papal Crucifix: This smaller version of the Italian silver plate crucifix above is approximately 1 3/4 inch tall (including ring) and 3/4 inch wide. No additional Cost. 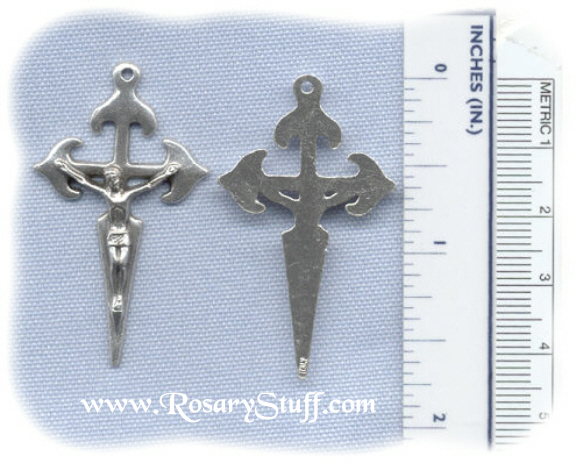 Le Salette Crucifix: This Italian oxidized silver crucifix's design is based on the crucifix held by the Holy Virgin during her visitation in 1846. Click here for more information. The nails represent man's sins. The hammer beats the nails while the tongs remove the same nails. It is 1 7/8 inches tall (including ring) and 1 inch wide. No additional cost.